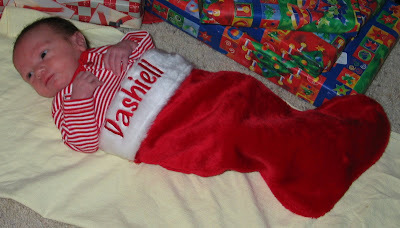 When we got home from the hospital, Annaliese noticed that Dashiell didn't have a stocking hanging with ours. Grandma Kathy will make him one that matches for next Christmas, but I had already told her not to worry about getting it done for this year, especially since we didn't know if he'd arrive in time. 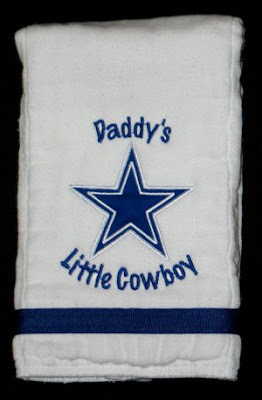 To appease Annaliese's concerns, Daddy and Annaliese ran to Wal-Mart and picked up a stocking. 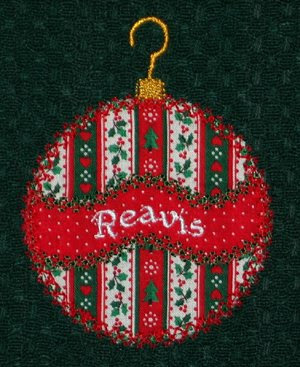 Christmas eve, at 9pm, I stitched his name on it! I used Embird Alphabet #8. 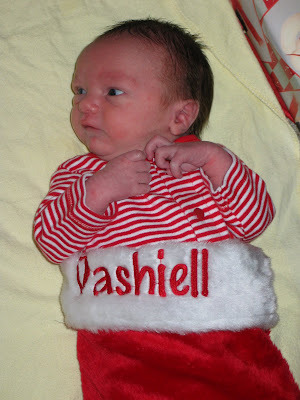 While I'm posting pictures of Dashiell from today, let me give an updated modeled picture of a previous project. 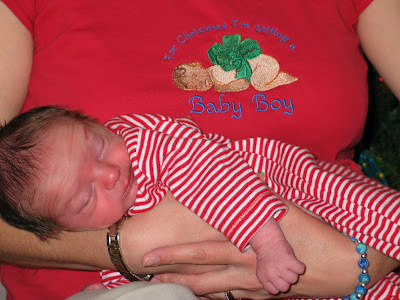 In August I made Annaliese and I matching shirts to announce that our baby was a boy. I did get my boy in time for Christmas!! Annaliese has been enjoying playing games on Carlin's laptop. The wireless mouse we used on it died, so for Christmas I picked up a small pink mouse for her to use. 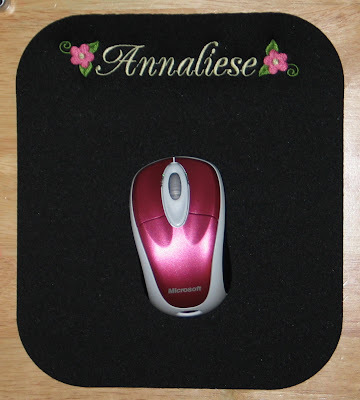 While I was at it, I grabbed a cheap $3 mouse pad and brought it home to monogram for her. I used Embird Alphabet #38 for her name. I lifted the flowers from an Embroidery Library Design that I had. 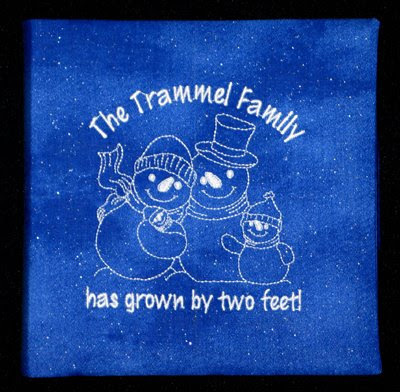 The Trammel Family has grown by two feet! As a Christmas gift for both of our moms, I made a brag book for each of them to fill with pictures of Dashiell (and Annaliese). 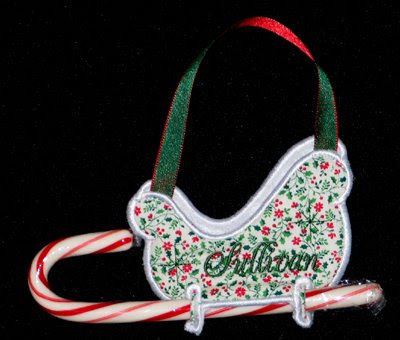 The design is from Charming Station, part of their free redwork snowman collection. This design is #39, released in February. When I downloaded it, I was hopeful that I would get to use it. We were ready to start trying for a baby, and if successful, (which we were) we would be due near wintertime. At the time I wasn't sure how I'd use the design, so I'm just glad I remembered I had it! The phrase came with the design, but I redid it with Embird Alphabet #8. To make the album cover I used one piece of fabric for the front and two smaller pieces for the inside. 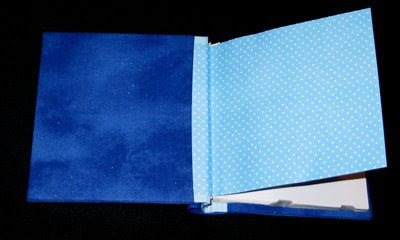 I stitched them together to create basically a dust jacket for the photo album. I was pleased with the results and glad I didn't have to use glue. :) The added benefit is that the cover can be slipped off and I can add Dashiell's name to the spine, now that his name is known. I got the albums done and in the mail before giving birth. 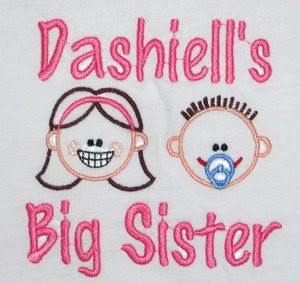 We included a couple ultrasound pictures, as well as photos of the three of us awaiting Dashiell's arrival. 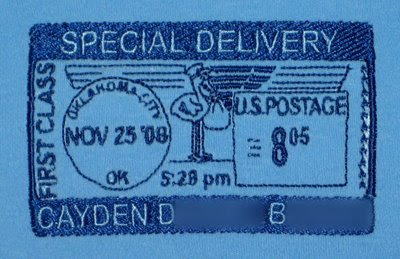 Then, thanks to Walgreens.com, I was able to upload pictures that they could pick up an hour later at their Walgreens 900 miles away. That gave them up-to-date pictures within hours of receiving the albums in the mail. We'll continue to upload pictures over the next few weeks until their album is filled. What fun! 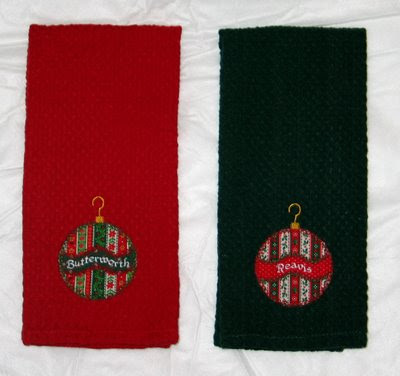 Sue kept me pretty busy this fall with her Christmas order. It was fun to help her give lots of personalized gifts. 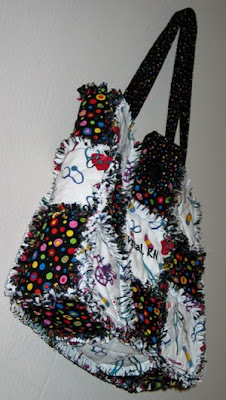 First, a rag bag for her daughter. This is a project that has been in the making for a long time. 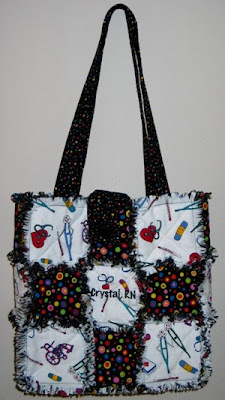 I found the nursing fabric last Christmas and purchased it, knowing Sue had interest in a bag for her daughter who had recently become a nurse. There was no immediate rush for getting it done, so we both took our time shopping for coordinating fabric, etc. 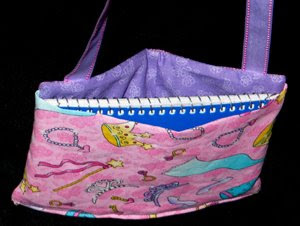 Her family made an unexpected move at the same time my morning sickness hit, and I knew there was no way I could get the bag made before they left FL. She gave me a deadline of Christmas, which I met. :) It was finished in October, but I'm just now posting the pictures. 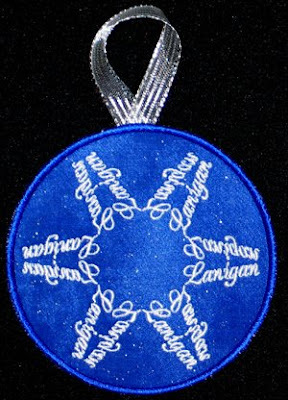 And finally I stitched 13 of the Name Snowflakes for her. I used Embird Alphabet #38 for all of these. I love how each name makes such a unique flake! Michelle ordered a couple items to give as Christmas gifts. 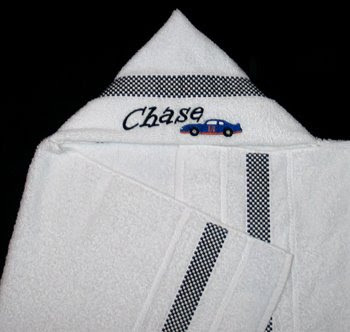 First, a hooded towel for her nephew Chase, who is really into Hot Wheels and Matchbox cars. I used 8 Paws and a Claw's Indie Alphabet for his name. The car came from GeoTheDigitizer. 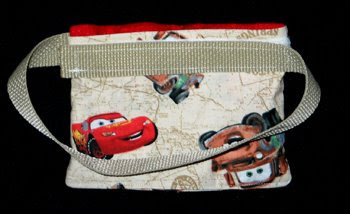 Another item is for Michelle's sister-in-law, who has recently lost over 100 lbs with Weight Watchers. The story goes that when she went in for her first appointment, she declared she was going to be a "results not typical" client. This shirt is to celebrate her achieving that goal!! What a fun gift! 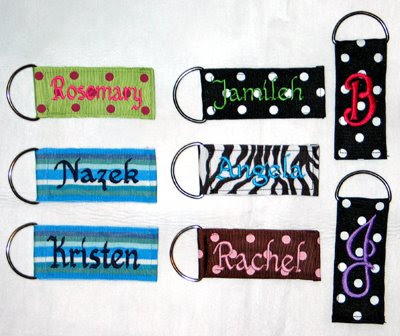 Kristen ordered some key chains and koozies to give as gifts to Madison's teachers, as well as some other friends. 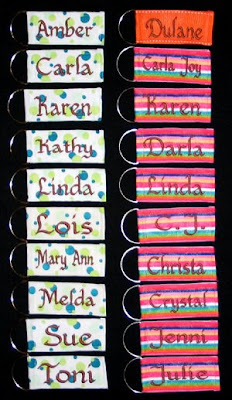 I used Embird Alphabet #33 for the keychains with full names. 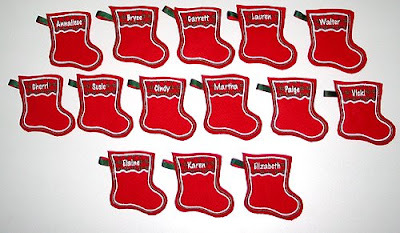 The "B" initial is Embird Alphabet #21, and the "J" initial is Embroidery Arts Empire Monogram -- that's my favorite one -- I might have to make another for myself! I used Embird Alphabet #8 for Aaron's koozie. 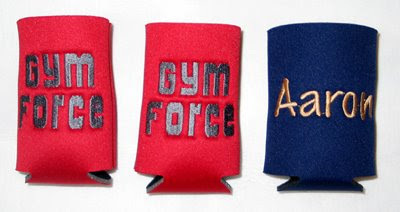 Kathy helped me by digitizing "Gym Force" for me. 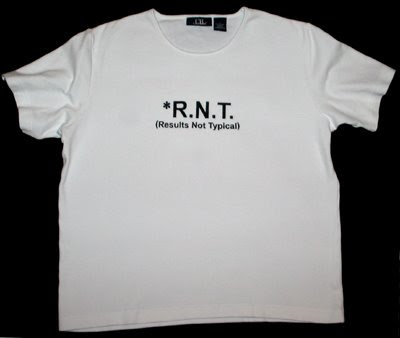 We were attempting to emulate their logo, but didn't know what font they used. Kathy used the font "FM College Team" which is a decent match. The faces are from Embroidery Library's Stick Figure Faces. 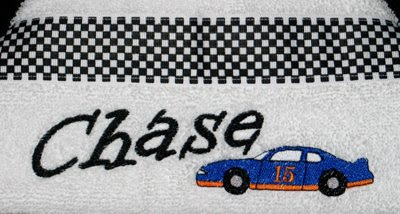 You actually won't find these exact designs there... I combined some faces to create my children. The baby design originally has one single curly-Q hair standing up. I took a gamble that Dashiell would have lots of spiky hair like Annaliese did, so I borrowed the hair from Boy 3 and put it on the Baby design. 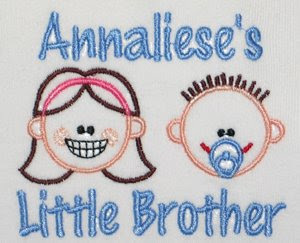 Annaliese is a combination of Girl 4 (headband and smile) and Woman 7 (lack of bangs). I added the text with Embird Alphabet #8. I got these shirts done last Saturday. I wrapped Annaliese's and packed it with her things. 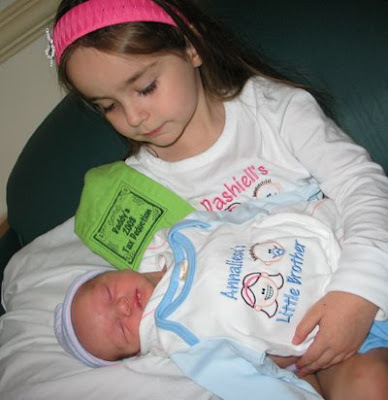 Once we called Annaliese to tell her that her brother was born, she unwrapped her package, put on her new outfit and headed to the hospital. 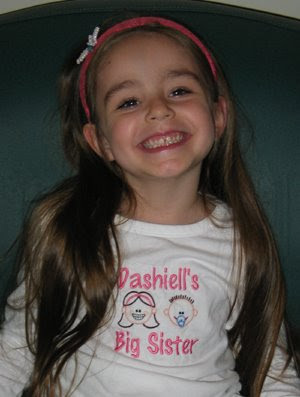 She wore her shirt when she met Dashiell last night, and when she came by this morning to see us again. Can you tell that she is so "eggcigig" to be a big sister?? I'm blogging from my hospital bed. 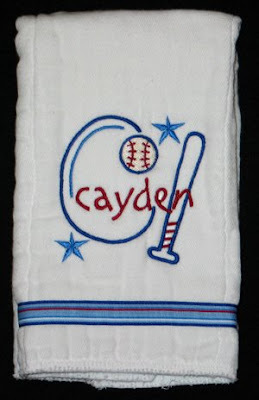 I'll post more embroidery projects for Dashiell once we are home. 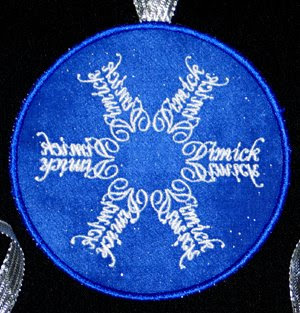 Last Christmas I stitched a few personalized snowflake ornaments. 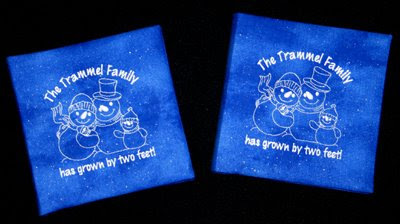 This year I received a big order for some (pictures will be posted later) and that reminded me of them myself! 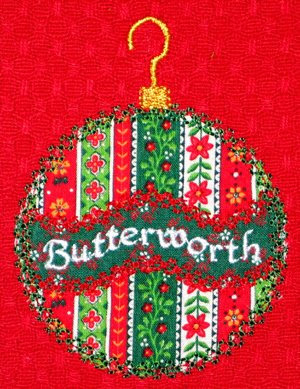 I think all together I've stitched twenty of these. My machine is definitely ready for a break, but they sure are pretty!! For all of the snowflakes I used Embird Alphabet #38 for the last name. After reflecting and rotating it several times, I created a unique name flake. 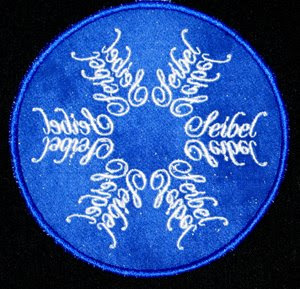 The design is then place inside an applique circle. I stitch it on tearaway stabilizer. 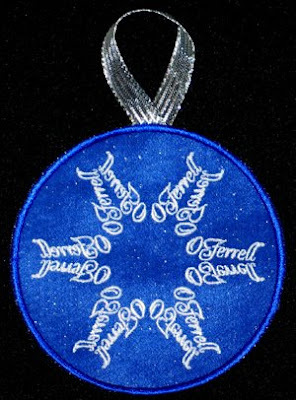 This enables me to give the ornament a fabric-covered back and a satin stitched edge. 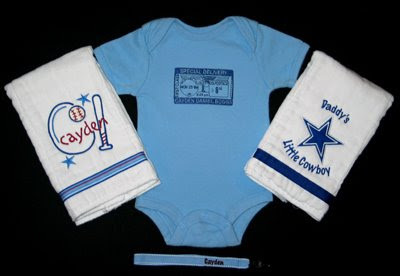 Here's a small set I did for Carlin to give as gifts. 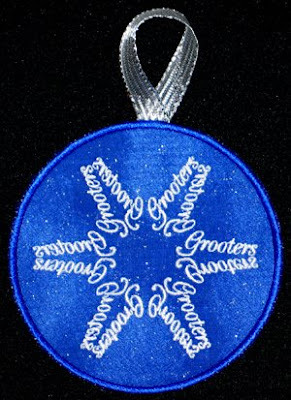 Sadly I don't have time to make one for everyone in the company. These are for his immediate supervisor, his assistant, and his office mate. I also made a pair for Joy and Anna, our Realtors, but forgot to take a picture before giving them away. Early in the process of deciding how I wanted to construct them, I tried one other method. Instead of using fabric for the base (which necessitates a satin stitch edge to prevent fraying) I used felt as the base. Since it doesn't fray, it could just be trimmed. 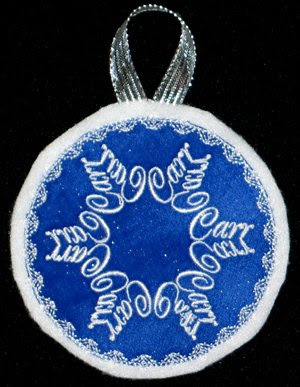 I still liked the look of a white flake on the sparkly blue fabric, so I appliqued it onto the white felt, using a decorative stitch. To test this, I chose my maiden name and sent it to my mom for her birthday. In the end, I guess Carlin and I prefer the look of the other style, so that's what I stuck with. But this is a pretty alternative, and I may return to the concept again next year. Last week I got all the stitching done for the preschool gifts I wanted to give from either myself or Annaliese, and now it's safe to post pictures! 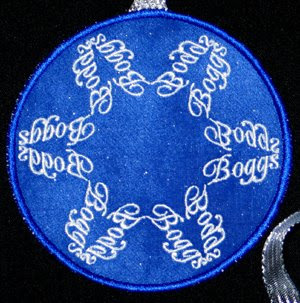 The applique ornament design is from Embroidery Boutique. 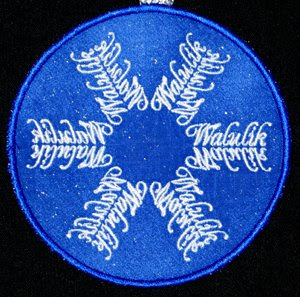 I added their last names with Embird Alphabet #33, shifting the letters up and down to mimic the wave in the ornament. Annaliese picked who got each towel color as well as the fabrics (with a bit of guidance) and I thought they turned out nice! 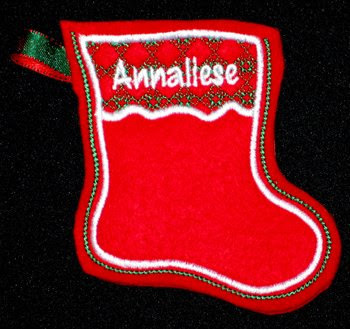 Finally, as a little favor for all of Annaliese's classmates and the whole staff, I made these personalized stockings. 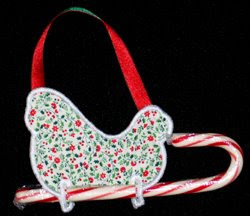 They are designed to be gift card holders (from A Design by Lyn), but I just slipped some chocolate inside. I added the names with Embird Alphabet #8. As usual, I have a hard time photographing red items, so believe me they look cuter in person. Here's a close-up of Annaliese's. She insisted on having a new one even though she has one from Grandma and at least one from last year when I made them. 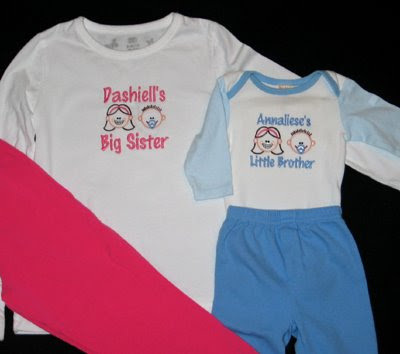 Rachel contacted me regarding birthday gifts for the twins she watches during the day. 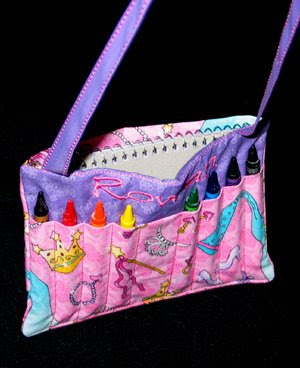 They are turning three, and she knew a Crayon Purse would be perfect for Ava. 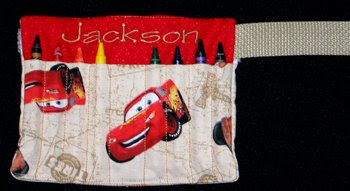 But she didn't think Jackson would like a purse or tote, so she asked about making a Crayon Tool Belt. I thought this was a great idea and after brainstorming together I had a plan. 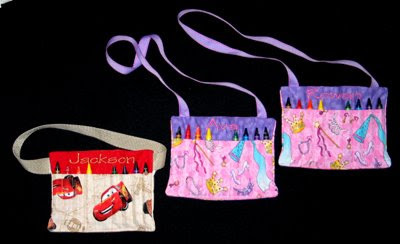 A couple days before actually stitching these out, Rebecca emailed wondering if I had time to squeeze in a crayon purse for her niece, so I was able to make all three at the same time! 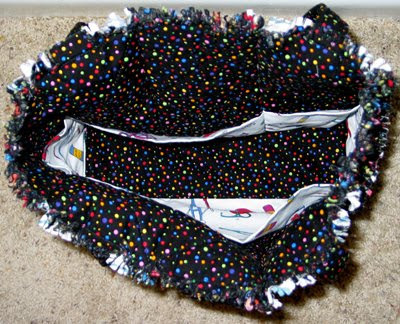 It's been a while since I've posted pictures of a crayon purse, so here is what it looks like from the front (personalized with slots for crayons) and back (pocket for a notebook, stickers, etc). The Tool Belt was a little more work, but I enjoyed the challenge. 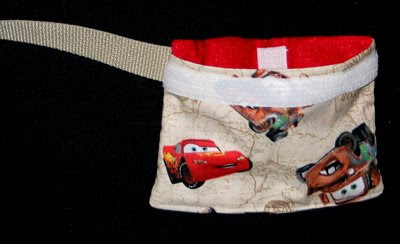 I used webbing for the belt, stitching it in one side of crayon pouch, and then attached velcro to the other end, as well as the back of the pouch. 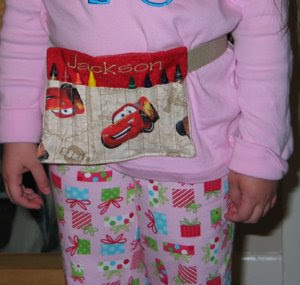 In an effort to keep the back pocket from gaping open, I also added a velcro closure there.